ExtraordinAir Threading System™ With just a gust of air, ExtraordinAir takes thread through all loopers instantly. Threading has never been this fast, easy or extraordinary. 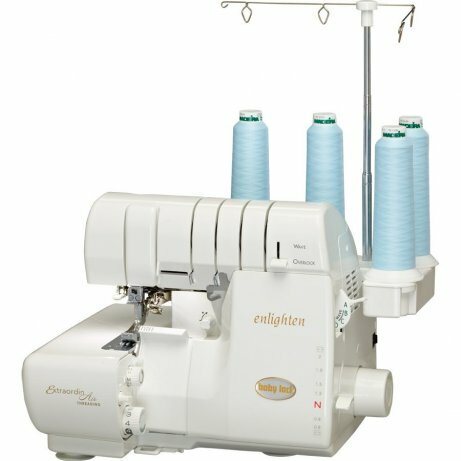 Automatic Thread Delivery System Set the Enlighten to the type of stitch you want and serge. The Enlighten will deliver a balanced stitch on any fabric with any type of thread. It even goes from one fabric type to another without skipping. Pure Lighting with 3 LED lightsThe LCD lights bring new clarity to serged stitches, which gives it pure lighting. Full-Featured Differential FeedGather fabric with a true 2:1 ratio on any fabric, even lightweight knits! Baby Lock took the differential feed mechanism to a new level by adding a single unit feed dog mechanism.Gather and stretch your fabric as you like, and know that you will end with durable, consistent stitch every time. Exclusive Wave Stitch The patented Wave Stitch opens your world to more decorative stitches for more creativity. Try different thread colors and stitch widths to easily serge a one-of-a-kind creation.